This post describes what abilities are and why they matter in Celtic Heroes. Abilities represent your level of aptitude for particular weapons and sets of skills. Many higher level creatures are difficult to hit with weapons, and high level or complicated skills are difficult to use. Every weapon and skill has an ability that is linked with it(swords are linked with the sword ability, for example), and by acquiring that ability, your character can begin to use their weapons and skills effectively. In order to acquire an ability, you have to visit a trainer. Many different trainers exist throughout the land, and while some offer their training for free, most will charge a fee. Most trainers will only train characters of a certain class, so you might have to search for a little while before you find someone to train you. When you acquire an ability, it starts with a level of zero. This level, though, increases with use - once you have acquired the sword ability, using a sword in combat will make your ability increase. For every level your character has, they can gain ten levels of ability. Every time you level-up your character, your maximum achievable level for each ability is raised by 10 points. You can level your ability by successfully using it on an enemy. Evaded, dodged, resisted, and even incompletely cast skills will not level that ability. As you progress, your abilities will level at an increasingly slower rate. This rate can be increased by wisdom items from the platinum shop. Abilities have been significantly reduced in effectiveness during update 3, when they raised your skill damage or heal by only 1 point every 10 ability levels. 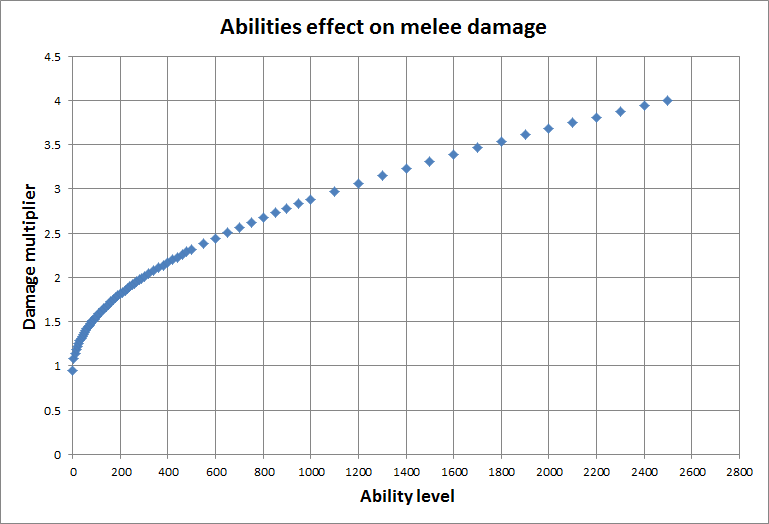 Abilities effect on auto attack damage is summarized below in the following equation and graph. During the starter's quest you will be introduced to three abilities: your first aid ability, skill ability and weapon ability. Classes that can use more then one weapon must pay an ability trainer to learn the specific ability. Update 3 also added 5 skill evasion abilities which all yourself as well as your enemy to dodge, resist and evade skill hits.